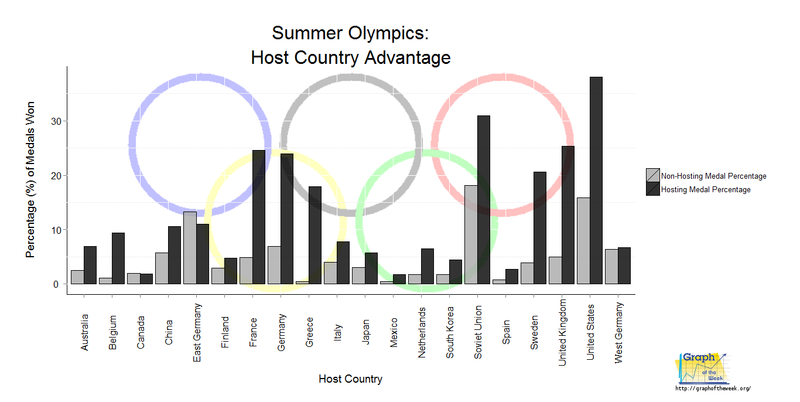 Graph of the Week: 2012 Summer Olympics: Home Court Advantage - How Will the Brits Perform? 2012 Summer Olympics: Home Court Advantage - How Will the Brits Perform? "I have achieved a lot and I'm grateful for that - I'm just a bit greedy because I want to add the Olympics. It's once every four years - everyone wants it and very few people get it." Take that sentiment and factor in competing in the Olympics in your home country. Talk about intense! What inspires an athlete to perform better in front of a home crowd? How is it possible to jump a little higher, throw a little harder or run a little faster when he/she would otherwise not do so? The graph above shows this effect using the host countries' medal percentage from all modern-era Summer Olympics. There is a sharp increase in the total number of medals won (as a percentage of all medals awarded) by the host country as opposed to when they are not hosting. It should be noted that some of the results are heavily skewed due to boycotts (which further increased the home countries medal percentage significantly) and other factors described later in this article. Coupling the home court advantage with an increasing number of events results in more opportunities for the host country to utilize this edge. 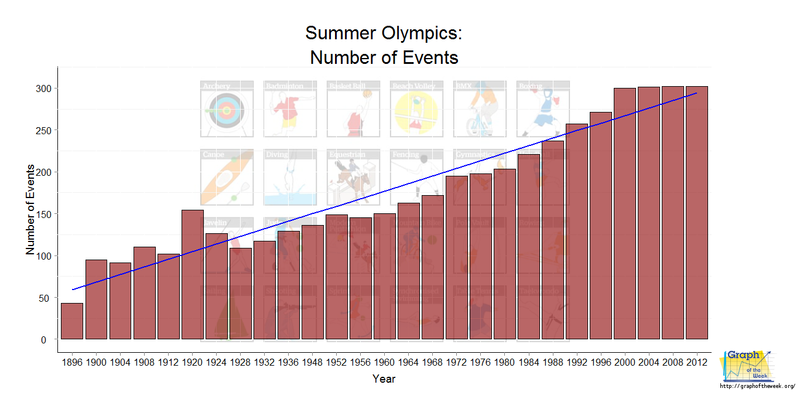 Back in 1896, there were less than 50 total events in the Summer Olympics. As the chart below reveals, that number has climbed to over 300 (302, to be precise). Therefore, assuming that local fans show up to most events, then there is more opportunity to cheer on the home athletes. On the other hand, it's difficult for any country to be proficient in every event. This is especially true for countries with financial difficulties or environments not conducive to Olympic sport. So, while there are more opportunities to have the home court advantage, there are also more opportunities for other countries to win. And win those other countries do: not only have the number of events increased, but the number of countries who are winning medals has also increased - a lot. As shown in the chart below, this number has increased from eleven in 1896 to over 80 in 2008 (currently this number sits at 79 in the 2012 Summer Olympics as of August 9, 2012 - only a few days left to go). Since more countries are producing Olympic-level athletes, it follows that the host country's medal count would be reduced due to the stiffer competition. This appears to be true since the winning percentage of the host country in the first half (through 1956) of the modern Olympic era was much higher (24%) than the second half (9%). Granted, most of the countries winning medals only win a small percentage, but overall it does take away from the major players. So How Much, Exactly, Is This Host Country Advantage? "It is not surprising that the model cannot explain all the variation in medal shares across countries as this will also be influenced by individual athletic performances, as well as by policy-related factors (including funding)." This can be illustrated when using the median winning percentage of all host countries - when hosting - is approximated at 8.5%. For these same countries, that drops to 3.4% when not hosting. When attempting to predict how many medals Great Britain will win using this method, we take 8.5% of the estimated 906 medals awarded (usually more due to ties) which will net them 77 medals. Therefore, it's probably best to examine each country individually to more closely estimate the host country advantage because each country doesn't have the same profile and number of athletes. So, applying a universal quantifier doesn't work all that well. That being said, Stephen Clarke estimated that host countries will perform about 1.5 times better than 'normal' (which itself is difficult to quantify due to above cited reasons) when hosting the Olympics. If that is true, then Great Britain will net about 53 medals (PricewaterhouseCoopers predicts 54 medals) at the 2012 Summer Olympics, using the last three editions to calculate 'normal' (35 medals). As of this writing (August 9, 2012), they are already at 51 with just a few days ago. That being said, Great Britain was already experiencing an upward trend in Olympic performance, so one cannot really tell if being the host country is truly providing an advantage or the Brits are just getting much better at the games. 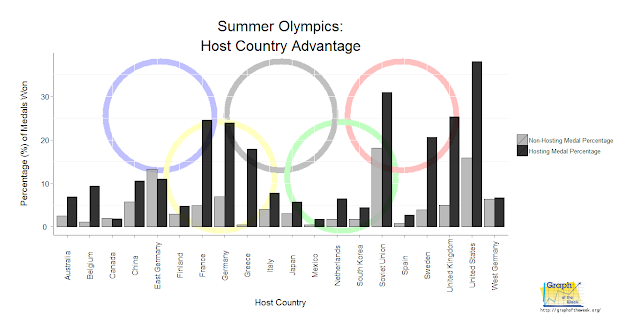 A quick search on Google will reveal several attempts at quantifying the host country advantage in the Olympics. Like any sport, however, if we knew the outcome what would be the point of watching? It's fun to make predictions, but they shouldn't be taken too seriously in this sort of context (perhaps oddsmakers would disagree). That being said, it certainly seems that the host country advantage lies between 1.5 and 2 times more medals than what might be considered 'normal.' Therefore, Great Britain will have won between 53 and 70 medals by the closing ceremonies. 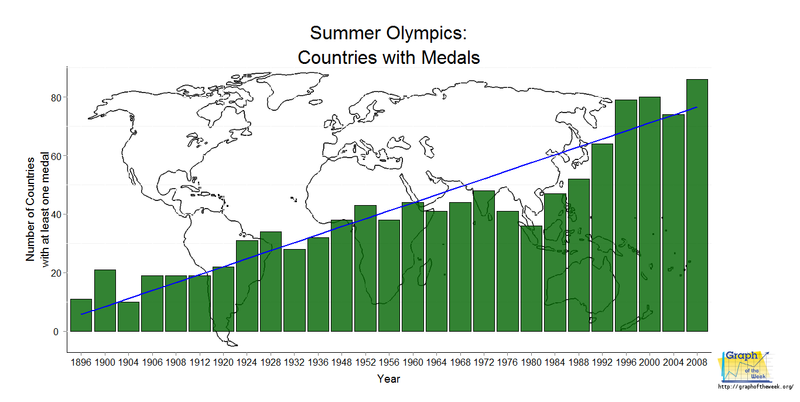 1) Will smaller countries be able to host future Summer Olympics? 3) Will Great Britain's performance decline in 2016? Great post. Just one correction - you probably meant to write 1984, not 1986? Good catch, but we were both wrong - I meant 1896! Patrick, Impressed once again with your focused detailed mind. China w/81 and Russia w/63?? Hey, Sarge - nice to see you posting again. Well, the home field advantage in the Olympics means that that particular country (the host) will perform 1.5 to 2 times better than they 'normally' do. That doesn't mean they will win the most medals; rather, it means that they will win more medals than if the Olympics were held in some other country. Great Britain won 65 medals in the 2012 Summer Olympics - that is about 1.85 times more than their last three Olympics average (35 medals). Does that make sense? I do enjoy your mental gymnastics! Nice post. Thanks for putting your code up too :) I like seeing the links to the sites that store this sort of data as well, so props for that. Often getting ones hands on the data can be the biggest challenge. You are quite welcome. You are very correct in your statement about getting data - that is certainly the hardest part for me. I like putting the links to the data up there so 1) others can use it and 2) it backs up my summations and 3) others can point out mistakes.